Albania is a hidden gem that’s only now starting to get its rightful moment in the sun. Just north of Greece, Albania has a beautiful coast line with delightful pebbly beaches and some of the bluest waters you’ll see anywhere in Europe. In fact, while the Albanian coastline is the same as Croatia’s and much of Greece’s, you’ll probably spend half or even a third of the price in Albania. Albania’s coastline is home to some of the most stunning beaches in Europe, and one favorite with tourists is Ksamil Beach, near Saranda and Corfu. Ksamil Beach has most conveniently located beach in all of Albania, in my opinion, and it’s also incredibly beautiful. For one, Ksamil is very close to Saranda, which is the entryway to Albania to anyone coming from Greece. For another, Ksamil Beach is within a short drive of two different UNESCO heritage sites: Butrint and Gjirokastra. With all those different cities and UNESCO sites in close driving distance, there’s so much to be seen in this beautiful part of Albania. However, I’ll be honest. Ksamil Beach is beautiful, but in my personal opinion, it isn’t the most beautiful beach in Albania. It can be a bit crowded with families, especially during the summer. So finding a little patch of beach on Ksamil to enjoy is kind of difficult. You’re better off swimming or taking a boat to one of the other islands rather than the part of Ksamil Beach that is part of the mainland. For me, the honor of most beautiful beach goes to Gjipe Beach further up in the Albanian Riviera. However, Ksamil Beach is still incredibly lovely and definitely worth a visit — it’s just not my favorite beach in Albania. Ksamil Beach also has some great restaurants serving super fresh seafood with Albanian and Italian touches. 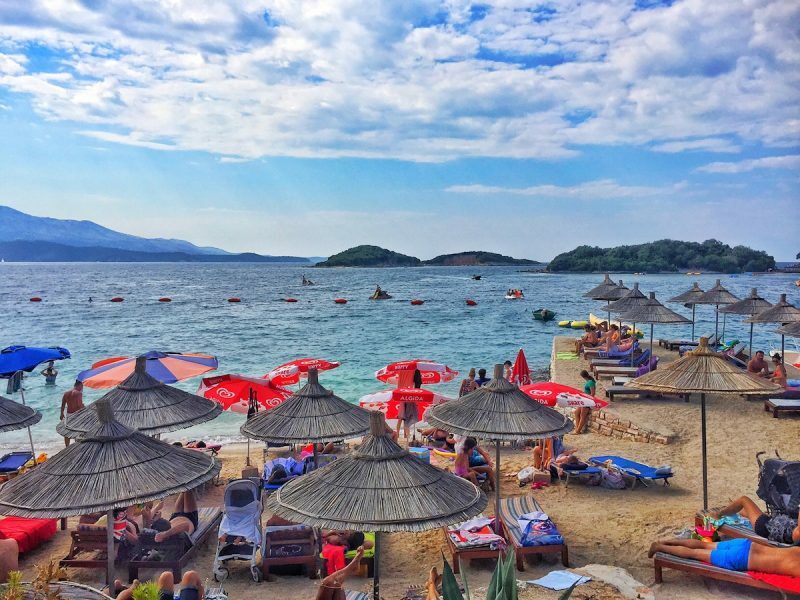 Whereas many of the beaches in Albania aren’t that developed, Ksamil has a pretty wide variety of restaurants and cafés to choose from on the beach. Plus, it offers chairs and umbrellas – not every beach in Albania does! Even though transportation in Albania leaves something to be desired, Ksamil Beach is relatively well connected by public transportation. I personally took the bus and found it really easy to get around, even on my first day in Albania before I knew how everything worked. To get to Ksamil Beach, you’ll always want to start in the port city of Saranda. From there, it’s a simple 10-minute taxi (about $5 USD) or 30-minute bus ride (about 70 cents). A bus ride will cost you 100 lek (less than $1 USD) and takes about 30 minutes to get to Ksamil Beach. Buses typically run every 1-2 hours, though, so be sure to ask someone as your guesthouse when it will arrive or you’ll be waiting a long time. You can also take a taxi, which will cost you approximately $5-10 each way, depending on your luck and bargaining skills. This is a good option if you have a few people with you or if you don’t mind spending a little more money for less stress. 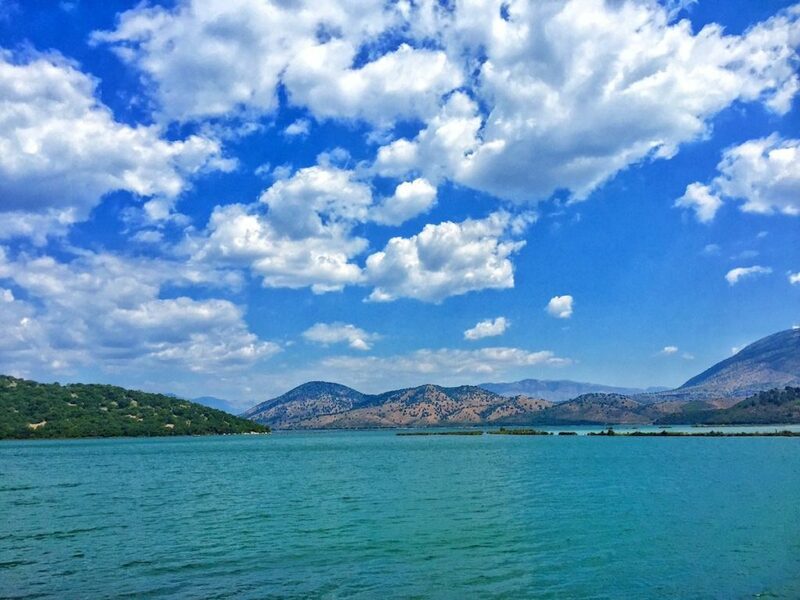 If you’re not already in Saranda, I’ll list a few of the most popular ways to get there below. If you’re in Greece and want to make your way to Albania, it couldn’t be easier to get there from Corfu. Simply go to the main port in Corfu Town and take the ferry. The ride takes about 1-1.5 hours, and it will cost you about $25-30 USD during peak season. Crossing the border in Saranda is very easy and only takes a few minutes if you are one of the first people off the ferry. The border agents speak good English and you should have no problems getting into Albania given that you are eligible for a visa on arrival (for those nationalities who need a visa, check here). But if you have a Schengen visa for Greece, you will automatically be granted entry into Albania, so visiting couldn’t be easier. Saranda is about 6-8 hours away by bus or furgon (minibus) from Tirana, the only international airport in Albania. Buses leave a few times a day from various points within the city. I wish I could be more specific than that, but bus times change often and rapidly in Albania. It’s also quite easy to get to Saranda from any point on the Albanian Riviera (Durres, Vlora, Dhermi, or Himara) if you are heading to Ksamil Beach from any point further north. Himara is about 2 hours away from Saranda; Dhermi, 2.5; Vlora, 3.5 or 4; Durres, 5. These are all rough estimates and will vary based on traffic and other factors. Ksamil Beach is slightly more expensive than other places in Albania; that said, it is still quite a bargain compared to other countries. Tourism in Albania is still in its early stages, and while Ksamil is more developed than most places, you’ll still enjoy lower prices. For an average hotel room, expect to pay around $20-30 USD per night. A villa fitting about 4 people will cost more like $80 USD per night. Food in Ksamil is also relatively cheap. 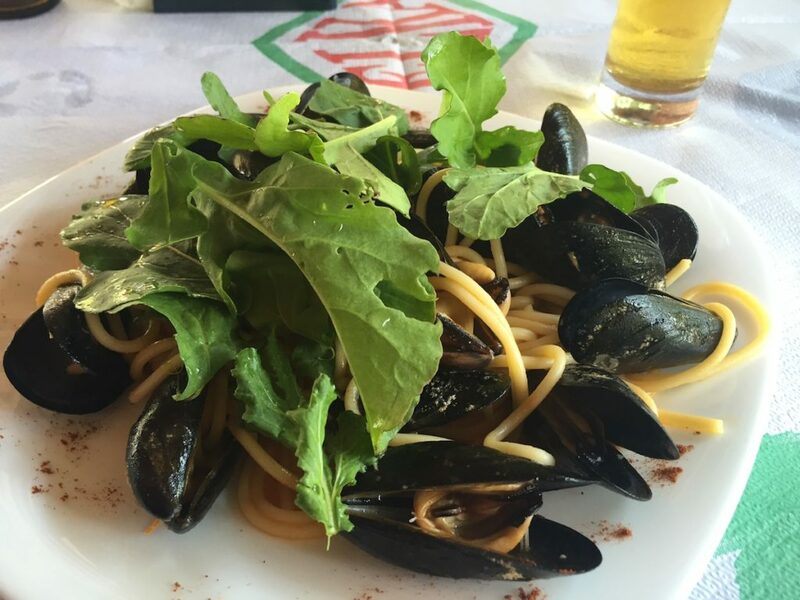 A pasta will cost you between $3-5 USD, whereas a seafood plate will cost you around $5-10 USD depending on what you get. There are also various “fast food” options like gyros which will cost you much less, usually around one dollar. Alcohol in Ksamil is also quite cheap, costing around $1-2 per beverage, and even less if you’re brave enough to try rakia – the Albanian national spirit consisting of distilled grapes. You may want to stay in Saranda where there are more hotel and restaurant options and transit to Ksamil during the day – it’s really up to you and what kind of holiday you prefer. I personally chose to stay in Saranda and do day trips from there. Altogether, for two people splitting a room, your cost will be about $50 a day to live and eat lavishly — or $25 around per person. Not bad for a beach holiday! Ksamil is composed of a handful of islands and a few beaches on the mainland. The beaches connected to the mainland can be quite crowded during the peak summer season. If you’d prefer a more secluded beach, you can either take a boat to one of the smaller islands or, if you’re a strong swimmer, it is possible to swim over. The distance isn’t that far. However, I’d recommend that you carry all your belongings in a dry bag as there is no access to lockers in Ksamil Beach, as far as I’m aware. There isn’t much to do in Ksamil except swim and sunbathe. 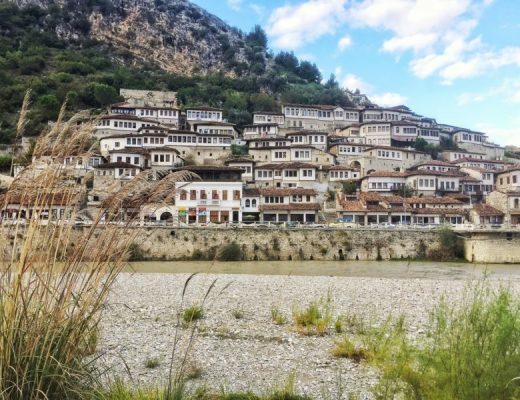 However, there are tons of day trips you can take easily and cheaply, such as visiting the Blue Eye (Syri I Kalter), the UNESCO World Heritage Site of Butrint, and the ancient “stone city” of Gjirokastra, also a UNESCO World Heritage Site, if you want to go a little further afield. The ruins of Butrint are very close to Ksamil Beach! 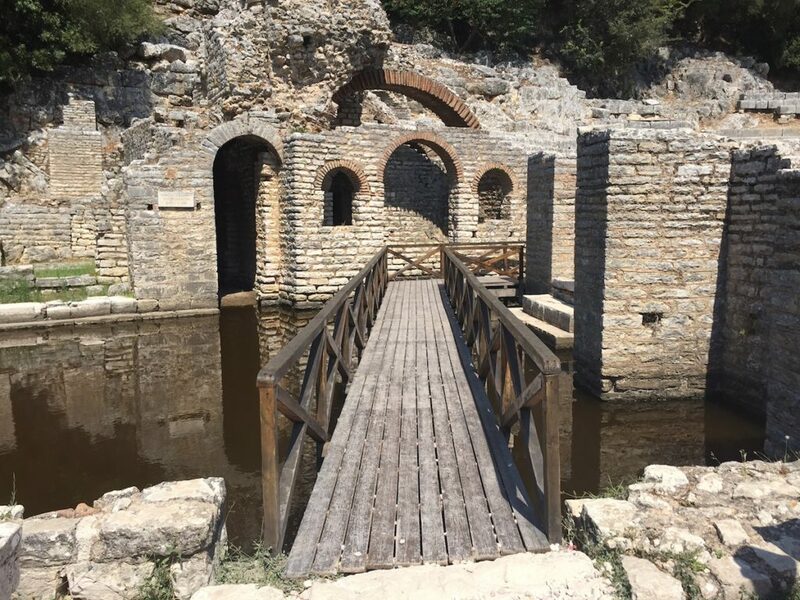 Butrint is definitely my top recommendation for a day trip from Ksamil Beach. It’s a UNESCO World Heritage site that rightfully deserves the honor. 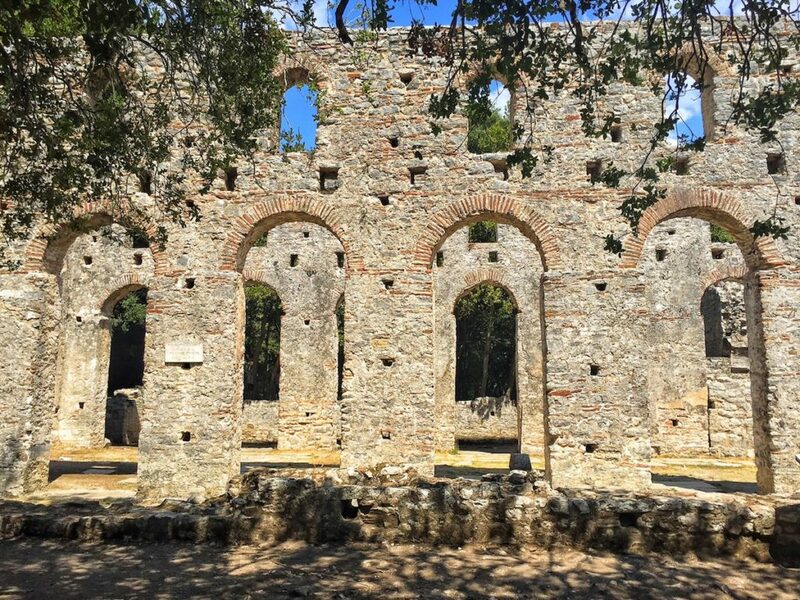 It’s been ruled by Romans, Venetians, Byzantines, and Ottomans, all of whom have left their mark on Butrint. For being over 2,000 years old, it’s in great shape. You can see a theatre, a baptistery with one of the world’s best-preserved mosaics, a basilica, and even ruins of an ancient suburb. The best part is that almost no one was there, even in the peak season (late August). I maybe saw 15 to 25 other tourists in the entire two hours I spent wandering the park. It’s also surrounded by a beautiful freshwater lake with crystal blue waters. Nature and history all in one… On a scale of one to life in prison, how illegal do you think it is to squat in a UNESCO site? You can stay in one of the many hotels or handful of hostels in Saranda, or there are a few options in Ksamil Beach too if you want. If you’re traveling solo, I recommend staying in Saranda. Stay at SR Backpackers, which is run by the wonderful Tomi – he will give you a crash course in the legend that is Albanian hospitality. Upon hearing that the first few words out of my mouth were about Albanian food, he correctly ascertained that I was a little bit obsessed with food. That led to a promise from him to cook dinner for me the following night, and he treated me to delicious home-cooked pasta with a squid and tomato sauce. The night after that, he threw a beachside barbecue for the entire hostel, stuffing us full of pilaf, pork souvlaki, and shepherd salad, and only asking for the equivalent of a buck or two in return. Great article and your pictures are beautiful! Well done Allisson! In January 2017, we are taking a year off and we will probably spend 6 months in South America then we will probably go to Europe . We will make sure to keep all your travel tips in mind if we end up in Albania! Patrick already visited Albania but I haven’t yet but your post made me want to be there right now! Thank you so much guys! That’s very sweet of you to say. Congratulations on your big next step! That is so exciting for you. 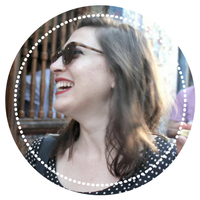 South America sounds lovely – it’s super high on the never-ending list of places I want to go! I hope you get to visit Albania, it’s truly an amazing country… probably my favorite country I’ve ever visited, to be honest! 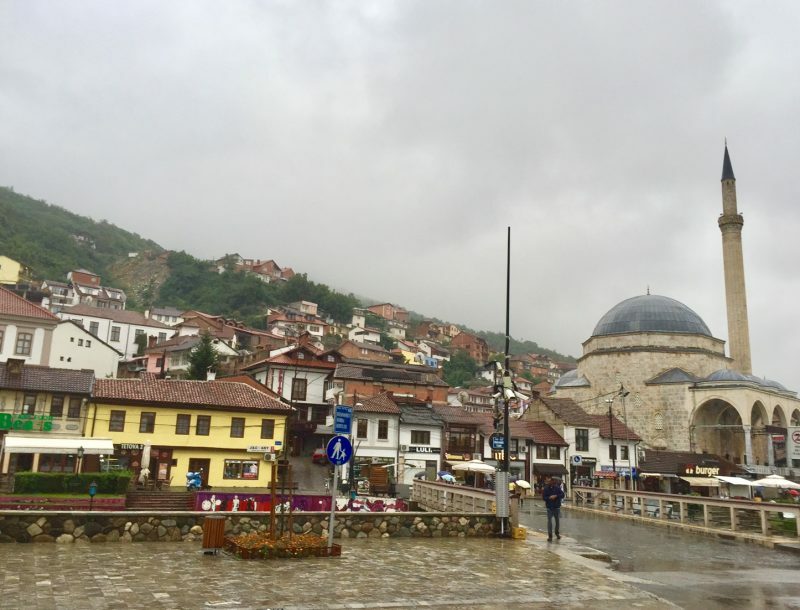 The Balkans are really a special place, and your money goes so far here. I’m spending a little less here then I did in Southeast Asia last summer, actually! Beautiful photos!! Now I know where to go in Albania. I am amazed from two of your articles i read for Ksamil and the 75 reasons to visit Albania. It is such a great motivation to us who are locals in Ksamil and try to make our best to attract foreigners. Thank you so much for advertising our beautiful homeland by these tips you give to people who may be interested in Albania. Thank you so much Merxhan! I loved visiting Ksamil so much – I think in no time soon you’ll be fighting away all the foreigners who want to come and see all the beauty Albania has to offer. I can’t stop raving about it to my friends and family! Hi Silje! You and your kids will have a fantastic time. If you have two weeks, I would split it up to book a few nights in Ksamil. I also would recommend going a little further north to Himara – it’s only about an hour and a half away and easily accessible by furgon (minibus) or regular coastal bus. 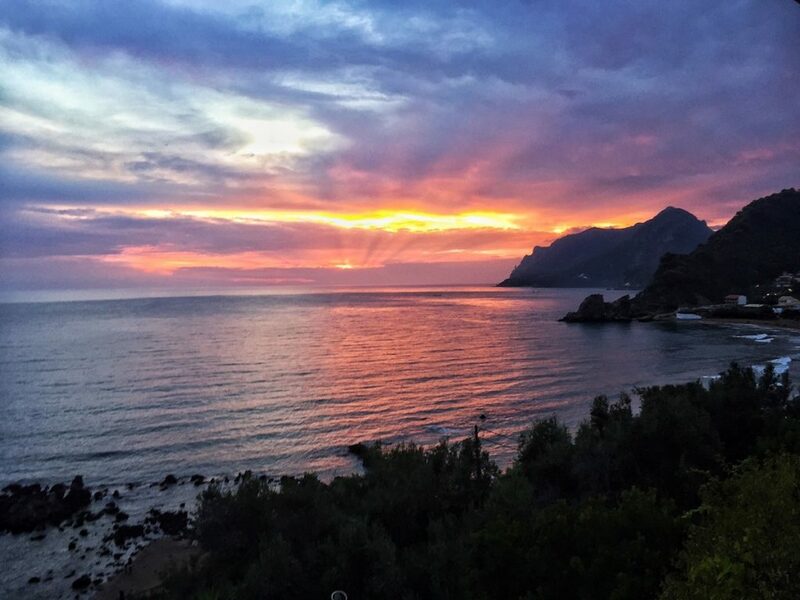 If you look through my Albania content, you’ll also find posts on the Albanian Riviera (Himara) and Gjirokastra and the Blue Eye which may be relevant for planning your trip. Definitely try to visit the Riviera! Beaches are much, much nicer close to Himara! 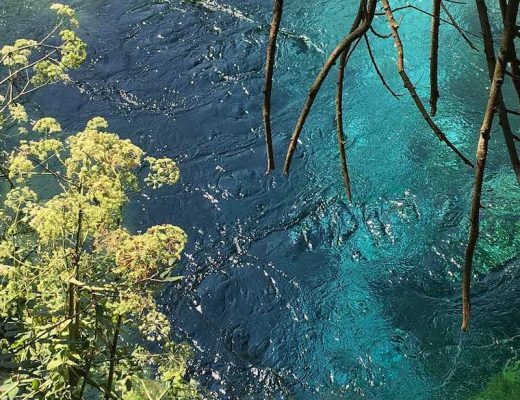 Here’s what I would recommend for 2 weeks: 6 days Himara, 5 days Saranda (do a day trip to Gjirokastra and Blue Eye, both can be done in one day), and 3 days Ksamil. There are plenty of restaurants near Ksamil but not much aside from that. Ksamil is definitely also possible as day trips from Saranda but since you have so much time, why not try staying there a bit as well? you’re welcome! I hope you enjoy 🙂 Albania is beautiful! trip from uk in September 18… any tips on getting around…especially on best and safest easy ways to get from sarande to ksamil? Hi Julie, the best and easiest way is to take a taxi, which should cost about $5 USD each way I would guess.